LocoMOEtive was #1 in Autonomous at Westtown, with 752 Auto points. 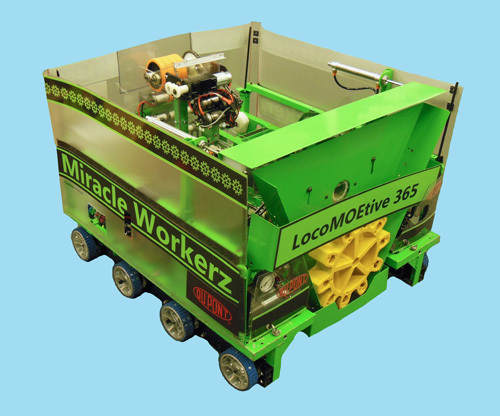 LocoMOEtive is a bright green and black robot designed to collect and place gears quickly, hold lots of fuel and score in the high efficiency boiler accurately, and climb quickly onto the airship. MOE has a 6-CIM, 8-wheel drive, a wheeled shooter, fuel agitator, target tracking, climbing mechanism, and many sensors for game-playing efficiency. Large fuel capacity: can carry more than 80 balls. Can load 50+ balls directly from hopper. Can sweep fuel from the floor and load into the robot while moving at full speed. Climber can lift the robot in <4 sec. Climber camera allows for quickly locating and grabbing the rope. 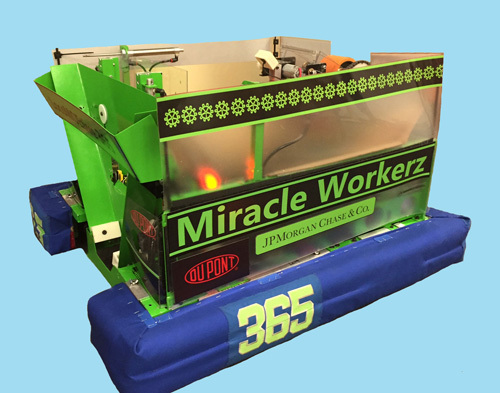 Collects gears directly from the feeding station, red light sensors and USB camera allow for highly accurate gear placement. Autonomous routines that include gear placement, hopper dump and shoot, shoot and place gear. Multiple autonomous modes including hopper-fuel scoring and multiple gear peg options.